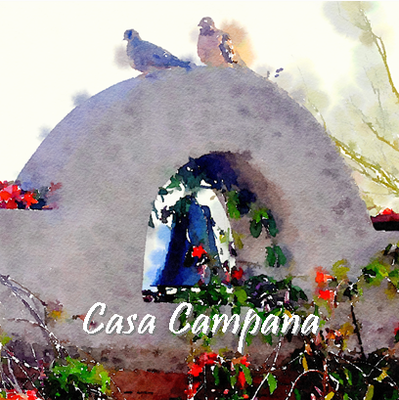 Casa Campana is located in the Tortolita Mountains foothills in the northern part of the greater Tucson area and adjacent to the Dove Mountain Resort community including the Dove Mountain, Gallery and Heritage golf clubs and Ritz Carlton resort. Only a short drive away are major Tucson area attractions including Mount Lemmon, Biosphere2, The Sonoran Desert Museum, Old Tucson, Tohono Chul Botanical Gardens, University of Arizona, and many great area golf clubs. Other nearby popular pursuits include hot air ballooning, off-road excursions, and mountain and desert hiking. Close enough for day trips from Casa Campana, historic Tombstone, Kartchner Caverns, Tubac arts community, Mt. Lemmon SkyCenter Observatory, and the Arizona Wine Country are all popular visitor destinations. Situated on a private lane of 3+ acre properties, Casa Campana itself affords a great Sonoran Desert experience including an abundance of desert plants/trees, cactus, birds (including mourning doves, night hawks, hummingbirds, ...) and desert animals such as javelinas, coyotes, and deer. The property's natural setting and privacy will be appreciated by all, but convenience is not sacrificed with restaurants, shopping and other services less than 5 minutes away.